Storks are the Stuff of Legend and Every Day Life - History? Because it's Here! The morale of the fable: Birds including white storks of a feather flock together. Stocks have enjoyed legendary status since ancient Egyptian times and people through the ages have believed that storks have human souls and bring good luck. Legend has it that in the year 452 Attila the Hun captured the town of Aquilleia in Italy near the head of the Adriatic Sea because of stork superstition. Attila and his forces had unsuccessfully laid siege to Aquilleia and he rode around the walls, angry and disappointed over the failure of the siege. Then he saw a stork leaving her nest in one of the towers and flying toward the marshes with her family flying alongside. Deciding that the stork signified a favorable omen, Attila decided that the stork wouldn’t abandon her home unless the towers were doomed to ruin and solitude, so he renewed the siege. He ordered his men to make a larger breach in the part of the wall where the stork took flight. Attila and his men assaulted the walls with wild fury and Aquilleia soon lay in ruins. A Nineteenth Century madchen-young woman- in North Germany closely observed storks in the spring. If a stork chattered with its bill, it meant that she would break something. If the stork flew, the madchen would be a bride before the end of the year. If the stork stood upright, the young woman would be asked to stand as god mother for someone. German and Dutch householders often placed high platforms on their roofs to encourage storks to build nests because they believed storks brought good luck. An ancient northern European legend said that storks delivered babies to new parents. German folklore has it that storks found babies in caves or marshes. 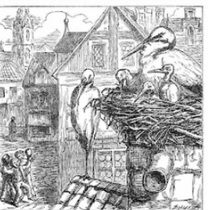 People would notify the storks when they wanted children by putting sweets for the stork on the window sill. The storks brought the babies to households in a basket on their backs or held them in their beaks. The stork legend spread around the world. German ornithologist Johannes Thienemann, was one of the first to study stork migration in 1906 at the Rossitten Bird observatory, located in what was then East Prussia. Despite the scarcity of stocks in Rossitten itself, the Rossitten observatory coordinated ringing stork species throughout Germany and across Europe. Between 1906 and World War II, the Rossitten Observatory ringed over 100,000 storks, and between 1908 and 1954, the Observatory recorded over 2,000 storks wearing Rossitten rings. More modern ornithologists have determined that in August and September, white storks fly from Europe to their winter grounds in Africa where they often congregate in large flocks often numbering over 1,000 birds. In spring, the white storks fly north, arriving back in Europe in late March and early April after about 49 flying days. During the Middle Ages the white storks thrived because of human activities such as clearing forests for pastures and farm land. Then in the Nineteenth Century the white stork population began to decline and by the early Twentieth Century storks had disappeared from several European countries. In the 1980s, in the upper Rhine River Valley an area closely identified with the white stork for centuries, the stork population had fallen to fewer than nine pairs. In the early Twenty-First Century, European countries are sponsoring conservation and reintroduction programs, and storks are breeding once again in European countries, including the Netherlands, Switzerland and Sweden. In February 2011, bird watchers in the Netherlands counted 592 storks wintering in the Netherlands, a number up by 100 from 2010. Reintroducing storks raised in zoos into Italy, the Netherlands, Sweden and Switzerland have stopped further declines in stork populations. In Sweden, Switzerland, and the Netherlands feeding and nest building programs have also help sustain the stork populations. Continuing threats to white storks include draining wetlands, contact with overhead power lines, pesticides like DDT in Africa, and illegal hunting on migration routes and winter grounds. In partnership with Storks Without Borders, Bird Life in Belgium has been tracking migrating white storks on their route to Spain and West Africa since 1999. They follow migrating stocks and use satellite tracking data to compose a detailed pictures of the migration routes, stopover sites, potential problem areas and threats. They are still tracking one adult white male stork on his fifth autumn migration. On August 30, 2010, he covered 277 miles one day through central France, which is a much longer distance than the approximately 124 miles on the western route across Europe. As Aesop says in The Farmer and The Stork, birds of a feather including white storks, flock together, but modern European farmers and conservationists don’t kill them, even if they harbor a few cranes in their flock. In Europe white stocks are welcomed, even if they aren’t delivering human babies! Fischer-Nagel, Heiderose and Fischer-Nagel, Andreas. Season of the White Stork. Carrolrhoda Books, 1986.